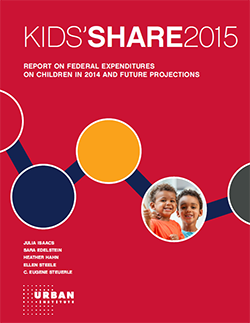 Kids’ Share 2015 is our ninth annual analysis of federal spending and tax investments in children and families. The report finds the children’s share of the budget is flat at 10 percent of the budget, and that tax policy accounts for 50 percent of federal investments in children. Kids’ Share 2015 projects that absent any policy change, children’s share of the budget will decline to less than 8 percent in 2025. Interest payments will outpace spending on kids by just 2018. Kids’ Share 2015 offers these detailed analysis on the federal budget, and more. The report was commissioned by First Focus and produced by the Urban Institute with support from the Annie E. Casey Foundation. Help us spread the word to #InvestInKids. A social media toolkit with suggested tweets, Facebook updates, and blog posts about Kids’ Share 2015 is available here.